The ideal travel companion, full of insider advice on what to see and do, plus detailed itineraries and comprehensive maps for exploring this cultured and vibrant nation.Explore Oslos excellent museums and enjoy the lively waterfront area, tour Norways spectacular Fjords, delight in a remarkable train journey on the steeply winding Flåmsbanen line, visit stave churches in Lom, Gudbrandsdalen and Lærdal, and see the Northern Lights: everything you need to know is clearly laid out within colour-coded chapters. Discover the best of Norway with this indispensable travel guide.Inside DK Eyewitness Travel Guide Norway:- Over 20 colour maps, plus an Oslo transport map, help you navigate with ease- Simple layout makes it easy to find the information you need- Comprehensive tours and itineraries of Norway, designed for every interest and budget- Illustrations and floorplans show the inside of Nasjonalgalleriet, Rådhuset, Vikingskipshuset, Akershus Festning, Borgund Stavkirke and more- Colour photographs of Norways fjords, stave churches, harbours and museums- Detailed chapters, with area maps, cover Oslo, Oslofjorden, Eastern Norway, Sørlandet and Telemark, Vestlandet, Trøndelag, and Northern Norway and Svalbard- Historical and cultural context gives you a richer travel experience: learn about Norways history, festivals, values and traditions- Experience the culture with features on Norwegian fjords, Bunad (National Day) and skiing- Essential travel tips: our expert choices of where to stay, eat, shop and sightsee, plus useful phrases, visa and health informationDK Eyewitness Travel Guide Norway is a detailed, easy-to-use guide designed to help you get the most from your visit to Norway.DK Eyewitness: Silver award-winner in the Wanderlust Reader Travel Awards for Guidebook Series 2018. . "No other guide whets your appetite quite like this one" - The IndependentOn a tour of Europe? 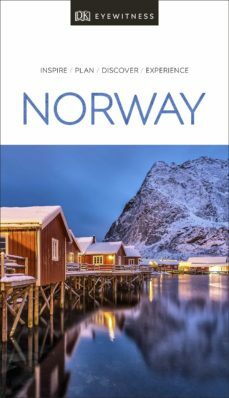 Try our DK Eyewitness Travel Guide Europe.About DK Eyewitness Travel: DKs highly visual Eyewitness guides show you what others only tell you, with easy-to-read maps, tips, and tours to inform and enrich your holiday. DK is the worlds leading illustrated reference publisher, producing beautifully designed books for adults and children in over 120 countries.